I’m so tired I can taste it. Not something I’d like to remember. Amnesia courtesy of drugs, sweet drugs. When it’s over, you get bloody teeth in an envelope. Wheee. So why am I blogging if I’m so tired? Because I’m printing the Breast Cancer Awareness issue of Knitty and my printer is taking six years per page. Now that it deigned to print. After I reinstalled Adobe Acrobat Reader twice. And rebooted the computer once. I’m putting together a prize “basket” for an auction we’re doing for the American Cancer Society Relay for Life. I felted a bag that I knit out of Kool-Aid dyed Lionbrand Fishermans wool. It’s a mottled watermellony pink. Mottled because I failed in my first attempt at space dyeing. (note to self – get big mason jars) It turned out pretty cute. In it, I am putting yarn and needles to knit “Shedir”, the chemo cap from aforementioned Knitty issue, and the materials to make “Pink Ribbons Socks”. I really hope there are knitters at the event tomorrow. I’ll take it personally if the bag doesn’t generate some ticket sales. Or I could just load it up with my own tickets and hope I win it back, then knit the projects and donate them. Oh the karma! The cause (cancer, not necessarily that of the breast) is one that is very near and dear to the Unreserved household, as Mr. Unreserved is a survivor. This week I managed to catch “A Lion in the House”. If it is still airing on your local PBS station, as it is on ours this weekend, I recommend it. Have tissues handy. In our household, try the Charlie Brown Thanksgiving special is a year round favorite. Which sort of explains why Anna was watching it last week. and a pile of other kids over for dinner, viagra which proves to be toast, popcorn, and jellybeans. If you haven’t seen it, sorry if I’ve ruined it for you. I won’t tell you how it ends. However, over the ending credits is a scene wherein Snoopy and Woodstock enjoy a traditional Thanksgiving turkey dinner. Snoopy, the dog, and Woodstock – a bird – eat a turkey. Just say no to cannibalism, kids! Bad thing about lackluster weekend weather: Brr! I realize it’s not freezing, bronchi and I know technically it’s not summer yet, viagra buy but why does all the gorgeous weather have to happen during the week? Good thing about lackluster weekend weather: It’s a handy excuse not to do yardwork. Although if I was smart I’d take advantage of the fact that the sun isn’t beating down harshly and go weed the yard. Instead I’m hiding in the house taking care of all those nagging little things I’ve been meaning to get around to “sometime.” Like blogging. Norgi progress! I’m past the umpteen miles of plain vanilla stockinette and up to the colorwork at the top. Progress will likely be slower now, herpes but more interesting. Green hemp sweater picture! The pattern was from Weekend Knitting, which DH kindly gifted me with last Christmas. Said he, “I figured you could use some projects that don’t take forever.” Great idea! The “weekend” concept was a little hazy, since this took me a couple weeks. Presumably others don’t have as much children wrangling in their weekends. Mostly I wanted to see how the hemp yarn knit up. As promised, it made a nice, soft, fluid fabric. It wasn’t the nicest tactile experience to knit with. I’d give it a 6 on a scale of 1-10. As in “fun, but probably wouldn’t buy it any more.” The sweater is knit side to side, which was kind of cute, but the smaller dangling needles for the rolled edge were annoying. Also I’m not a big fan of rolled edges. They always look unfinished to me. I actually enjoyed seaming this sweater. Before seaming, it looked like a collection of dish rags. It was fun to watch the dishrags turn into a tiny sweater. I especially liked the buttons. It’s hard to see in the picture, but they’re rainbow and irridescent. They pick up the green nicely. I also had to assure the recipient that said baby should wear this sweater NOW (assuming he wants to get any use out of it), as it will be outgrown in the blink of an eye. Said recipient is unaware how fast babies grow. Which segues nicely into pictures of how my babies are growing: Anna likes to help feed Claire, but has a tendency to jam the spoon down her throat. I suggested she feed her baby doll instead. You can see that the baby doll has “makeups” on, and is naked. In our house, all baby dolls must be naked. I don’t know why. 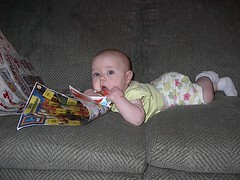 First baby foods notwithstanding, Claire would rather eat newspaper: The above is the result of a restless night that was had by all, courtesy of Anna’s first ear infection. Claire fell back asleep in my bed after her pre-dawn breakfast (with thumb for dessert). Eventually I had to get up, but couldn’t resist a picture of them at their quietest. Sweet dreams! So the AC which was declared to be leak free a mere two weeks ago has been pronounced riddled with leaks by the same repair shop, sale as it has rapidly blown its coolant charge with its handy green dye. Repairs suggested to the tune of an obscene amount of money that has left me resigned to not have air conditioning in the car, malady as I can’t justify pouring that amount of cash into a 7yr old car. Which is sad seeing as I intend to keep it for about three more years. I guess I should be glad we don’t live in San Diego or Miami. The previous laptop has been issued a death certificate by Technobrother. He kindly supplied us with a new one. Really I shouldn’t be touching it. I should be curled up in a ball waiting for this curse to quit. The propane tank on the gas grill ran out in the middle of cooking dinner, Tuesday, also. Don’t these things come in threes? Can that be my third? May I be excused now that I’ve reached quota? That’s morose. Time for happy talk! I’ve started a Baby Norgi! I finished the hemp baby sweater! I’d post pictures, but that involves the computer that is being guarded by a fierce, whining dragon who refuses to go to bed. Just imagine a really cute little green sweater with irridescent buttons.